In a large bowl, sift the flour, ginger, cinnamon, mixed spice and bicarbonate of soda. Stir to mix. In a saucepan, put the butter, sugar and golden syrup. Stir over a low heat until melted and smooth. Add to the dry ingredients and mix well with a wooden spoon to make a firm dough. Tip the dough onto a floured surface and leave to cool. Gently knead into a ball. Heat the oven to 180C. 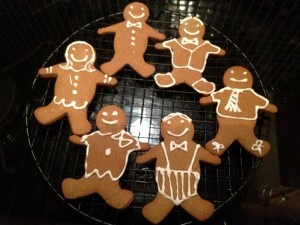 Roll out the gingerbread until it is ½ cm thick. Cut out the figures and place them on a tray covered with greaseproof paper. Bake for 10 minutes until slightly darker. Remove from the oven and leave to cool completely before removing from the paper. You can decorate these as you wish. I mixed an egg white and icing sugar until I had a royal icing soft enough to pipe.